A man who was frozen in time during the Republican era wakes up in the present to find that his descendants have grown to become disappointments and he tries to become a positive influence to them. In the year 1945 when Hong Kong fell, He Ding Guo (Carlos Chan) who was a 30-year-old guerrilla fighter at the time was captured by the Japanese to be experimented on. Seventy-three years later, he accidentally wakes from a frozen state. In the year 2018, He Ding Guo is disappointed to learn that his 73-year-old son He He Ping (David Chiang) and his 47-year-old grandson He Yong Niang (Wayne Lai) are both severely lacking in morals. He He Ping is shrewd and lies to get welfare. He Yong Nian is greedy for money. Try as he might, He Ding Guo finds it impossible to change their ways. At the same time, He Ding Guo settles at a job provided by the government where he meets the half-Chinese and half-Japanese Zhuang Si Chen (Rosina Lam). Moreover, a mysterious tycoon (Pat Ha) falls in love with a handsome younger man (Joel Chan). She gets pulled into a murder case involving him and hires He Yong Nian who uses geomancy to twist the truth, unaware that by doing so, he is sowing the seeds that will cause trouble to his own family. It is produced and distributed by TVB. Filming took place in Hong Kong. It was the breakout role that the 31-year-old Carlos Chan needed after struggling to make it big despite having worked in showbiz for a long time. The drama was highly-rated and brought attention to its cast of much-loved TVB actors. Carlos Chan, a non-TVB actor, who initially incurred doubt over his casting proved to be the perfect choice for the part. The series finale reached 27.3 points in viewership ratings. 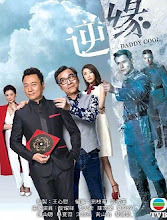 As of its airing, it became the third highest-rated TVB drama in 2018, just after The Forgotten Valley and Apple-colada. It ranked seventh in the top 10 highest rated TVB dramas in 2018 with an average of 26.7. It reached the highest total audience of 30.0. Let us know why you like Daddy Cool in the comments section. Please also share these fun facts using the social media buttons below.